Heat a table spoon of oil in a pan. Add rai, jeera, methi, urad dal and chana dal. Fry until the chana dal changes color to golden. Now add red chillies and green chillies. Fry fro few sec. and remove the ingredients into a bowl and allow to cool. Now in the same oil fry the curry leaves in a medium flame adding tamarind and little salt. Stir. When the leaves are cooked switch off the flame and let it cool. First grind the fried dals, and chillies finely in a mixie. No need to add water. Now add the fried curry leaves, garlic pods, salt to taste and jaggery. Grind to paste and remove it into a bowl. Heat 1/2 table spoon oil in a pan. Add 1/4 tspn mustard, 1/4 tspn urad dal, 1/4 tspn jeera, a red chilli and few curry leaves. Fry the thadka and add it to the chutney. 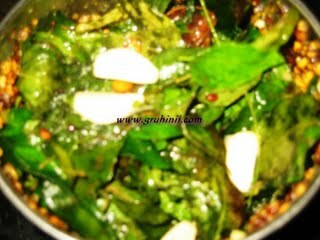 Andhra's Karivepaku Pachadi/Curry leaves chutney/Kadi patta ki chutney is ready.......Serve with steamed rice or rotis.